The Club Deluxe Veranda Stateroom boasts a significantly larger veranda than standard Veranda rooms. This lifts the onboard experience and for that reason we highly recommend it. The Azamara Quest Club Deluxe Veranda Stateroom has one of the largest verandas on the ship. In fact only the top suites onboard have bigger verandas. However, the internal space of the Deluxe Veranda room is identical to the standard Veranda Stateroom. Read our Expert Review of the Azamara Quest Club Veranda Stateroom. 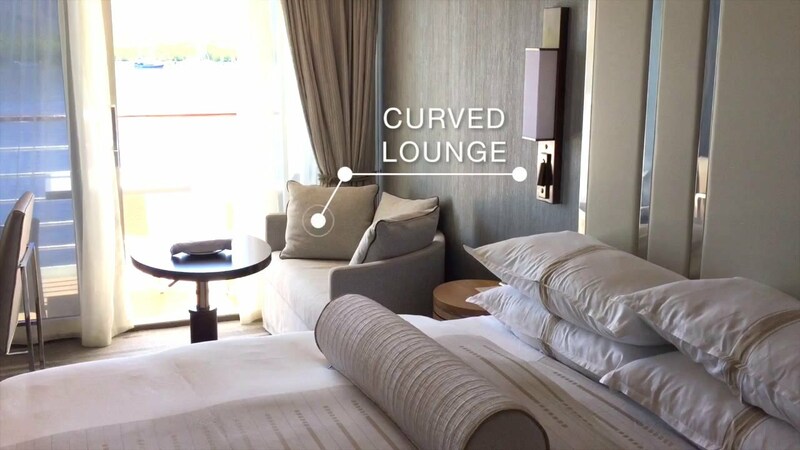 Read our Expert Review of the Azamara Quest Club Continent Suite. The Deluxe Veranda room is small with only 16.3 sq.m. / 175 sq.ft. of internal space, but it is bright and airy and includes thoughtful amenities like fresh flowers. As with all rooms on the Azamara Quest, it is immaculately maintained. There are ten Club Deluxe Veranda Staterooms on the Azamara Quest. These are located forward and aft on decks 6 and 7, and aft only on deck 8. The rooms at the front of the ship face forward, while those at the back face aft with views of the wake. The Club Deluxe Veranda Staterooms located at the front of the ship (6000, 6001, 7000, 7001) look directly onto the bow and can be very noisy when the ship drops anchor. The layout is typical, featuring a small entry hall with closet on one side and bathroom on the other. Beyond this is the bedroom and sitting area that leads onto the large veranda. Overall the inside space does feel somewhat restricted. There is not much room to move around the bed and living space. This is something that larger guests may struggle with. Azamara regulars will notice a marked difference in the stateroom décor following the April 2016 refurbishment. The Azamara Quest Club Deluxe Veranda rooms now have a clean, modern feel inspired by nature’s elements of water, sand, wood and stone. Tones of white, cream and charcoal are accented by dark honey colour timber and sparkling silver chrome highlights. The living space of an Azamara Quest Club Deluxe Veranda Stateroom. In the living space a queen size bed is framed by a luxurious leather bedhead with both mood and reading lights on either side. A large flat screen TV is mounted on the all opposite. The sitting area in the Deluxe Veranda room features a writing desk, convertible coffee table and 2-seater lounge with a curved back. The lounge looks great, but we are not convinced of its comfort when used by two people at once. As is customary, the coffee table can be converted to a small dining table should you chose to order dinner in you stateroom. The Azamara Quest Club Deluxe Veranda Stateroom veranda is exceptionally large. At up to 6.0 sq.m. / 64 sq.ft. it is almost double the size of a standard veranda. It is very deep and there is plenty of space to accommodate a large table and two comfy, padded chairs. Interestingly, the large veranda tends to make the room feel bigger too. The veranda is a wonderful space and it goes without saying that Club Deluxe Veranda room guests spend a lot of time out there. The extra large veranda of an aft facing Azamara Quest Club Deluxe Veranda Stateroom. The bathroom of the Azamara Quest Club Deluxe Veranda room is small, but surprisingly functional. During the April 2016 refurbishment the bathrooms received new timber cabinets below the vanity and new shelving. These features not only give added storage, but cleverly provide a greater sense of space. The bathrooms feature a makeup mirror and top quality Grohe tap wear. Lighting in the bathroom is excellent. The bathroom in an Azamara Quest Club Deluxe Veranda Stateroom. Hanging space for clothing in the Azamara Quest Club Deluxe Veranda Stateroom consists of a single closet with 3-timber doors. We note that these are noisy when closed. There is ample room to stow luggage under the bed. We think the large veranda of the Azamara Quest Club Deluxe Veranda Stateroom significantly lifts the onboard experience and for that reason we highly recommend the room category. In spite of the small inside space, the large veranda makes the Club Deluxe Veranda Room a welcome retreat. We rate it 4.0-stars.